Climate change is one of the most important planning challenges of the 21st century. Climate change poses a tremendous threat to Florida. Sea level rise, more intense precipitation, droughts, fires, and stronger hurricanes increase the risk of natural disaster and endanger the state’s economy and the safety of its citizens. Increasing coastal population and development will put more people and property in danger. If these risks are not mitigated, or plans for adaptation are not implemented, it could lead to devastating damage to our State. Planners are in a unique position to address climate change issues because the problem itself presents the full spectrum of the classical planning dilemma — it is long-range in nature, comprehensive in scope, and significant in impact. Planners will be called upon to address both the causes and consequences of climate change. The issue will require proactive responses across all planning sectors, from land use to transportation to natural resource management to public health and safety to economic development. As Planners, we have the opportunity and obligation to address the challenge of climate change. 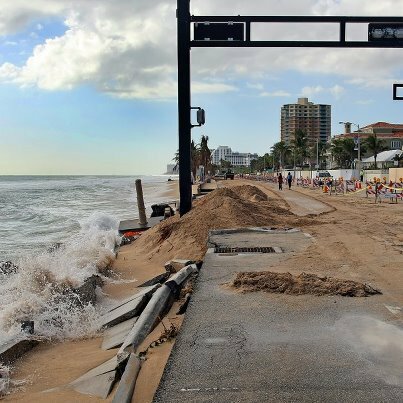 Damage from Tropical Storm Sandy in Fort Lauderdale. Most climate and atmospheric scientists agree that the earth’s climate is warming and that the most likely cause of this phenomenon is human-induced greenhouse gas (GHG) emissions. Global average temperatures have certainly increased; based on instrument measurements, each of the past three decades have been consecutively the warmest on record. These temperature increases correspond with measurable increases in the concentration of greenhouse gases in the atmosphere. Models developed by climate scientists indicate that the connection between our warming climate and increasing GHG concentrations is not accidental. The extent to which the earth is warming cannot be explained without taking GHG emissions into consideration. Consequently, we humans are causing most of the global warming which is changing the global, regional, national, and local climate. “Science is there to inform, but the choices of what to do are up to all of us,” is a frequent comment by prominent NOAA scientist Dr. Susan Solomon whose research has led to the identification of the cause of the ozone hole in Antarctica and how changes in surface temperature, rainfall and sea level are largely irreversible for more than 1,000 years after carbon dioxide emissions are entirely mitigated. Science tells us that climate change is certain and that its impacts will be increasingly frequent and severe. It is up to planners to heed Dr. Solomon’s call for action and help their communities decide what to do about climate change. The purpose of this web page is to provide web-based resources for the planning community. The content of the climate change section is intended to provide reference materials and examples that can be applied to planning practices for Florida communities, a toolbox of ideas that should be part of planning exercises, a list of reference materials and the presentation of measures that are potential areas for policy and technical requirements in the practice of planning for climate change.